Body art provides a high impact image for advertising, photo shoots, film, TV or corporate events and parties. Get your parties going from the start. A statue gives it a centre, a bodypainted model gives an element of surprise and both add a 'wow' factor. Statues can pose on a plinth or be positioned amongst your guests. Body painted models can mingle, serve drinks and have photos taken with guests. Dancers or roller skaters offer a dynamic visual element. The art can be in the form of a picture on the body or can create an illusion of the model being clothed. The photographs of the event can be used for promotion and advertising. We can source the models, statues or dancers and provide the styling and props to complete the image. 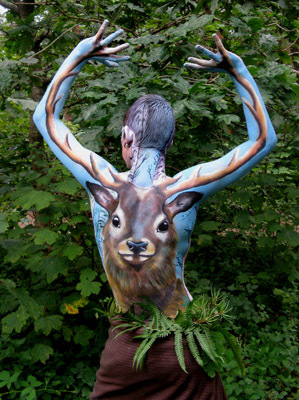 Any image or logo can be reproduced as body art. Please contact us to discuss your commission.